Scratching is a deeply ingrained instinctual behavior in cats. It satisfies many basic needs, including conditioning the claws for hunting and defense, stretching the back and shoulder muscles, marking territory, and releasing pent-up emotions and stress. We can’t stop scratching behavior, but cats can be taught to redirect their scratching to appropriate items. Cats are both predator and prey, and their claws are designed to be strong and sturdy for use in catching prey and as a primary means of defense. Unlike human nails, which grow from skin, cats’ claws grow from the last bone in each of their toes, or their “fingertips.” “Declawing,” or onychectomy, is the amputation of this bone (the fingertip), which also involves cutting the tendons, nerves, and ligaments to which the bone is attached. It is a major, irreversible surgical procedure that can put a cat at risk for a variety of physical and behavioral problems. 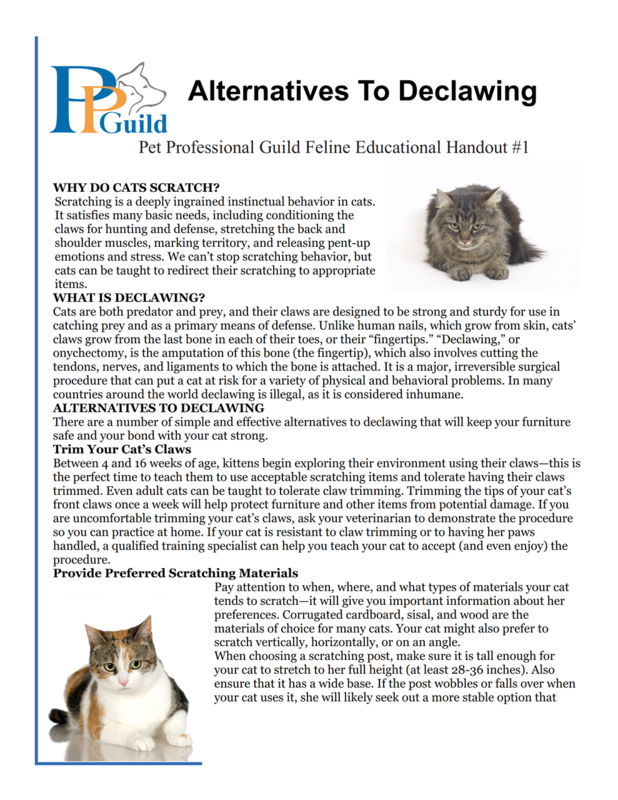 In many countries around the world declawing is illegal, as it is considered inhumane.